This photo was taken at Christmas, 1941. I’m sure I received a boxed set of soldiers that year, as I had each Chrismas before that, but they didn’t get into the picture. My favorite toy that year was the Marx M.D. War Department ambulance, in the foreground, because it fit in so well with my soldiers. 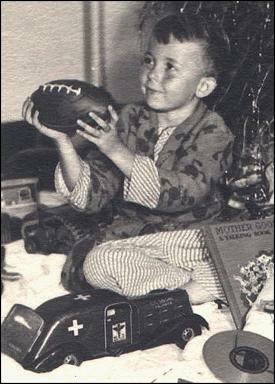 Wish I still had all these toys, but they disappeared when I went into the army in 1954. As for my current collection, the Betons take up most of the shelves. 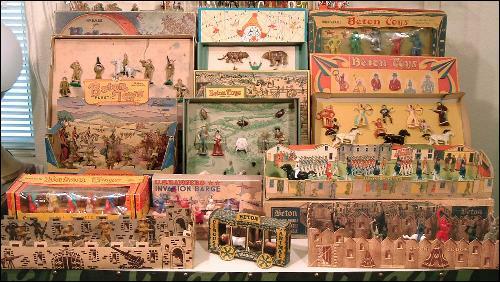 During WWII, Betons became my favorites when they were the only soldiers available in the Five & Dime stores. The wartime metal shortage had stopped all production of metal toys. The first is an overall shot, and each figure has every version included behind it. I put dioramas on the bottom tabletop, and they used to change fairly often. For the eagle-eyed collectors, I’ve included a few of my Beton conversions in the diorama. The shelves are just old, clear acrylic storage bins that I’ve turned on end. On the very top is some of my old HO-scale model railroad equipment that’s not Beton related. Below is a close-up of the top half of the display. The top left shelf holds my Universal Plastics figures, one of which I had as a child. Next comes a close-up of the bottom half. 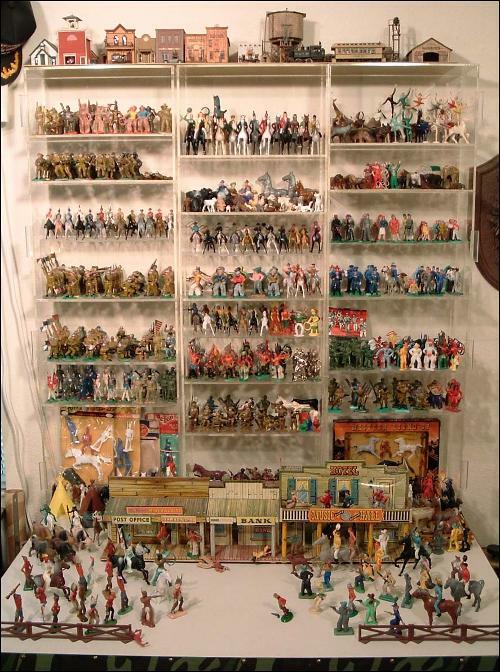 The shelf below the Beton Indians in the center contains Plastic Toys soldiers and farm animals. 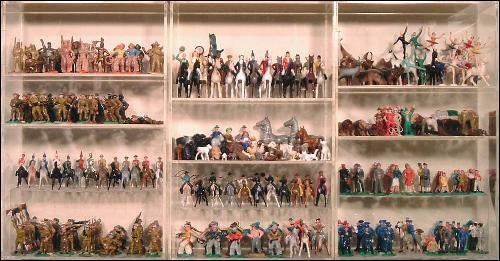 I collected them because I had one soldier, a horse, and a cow when I was a kid. The cow often substituted for a horse — it seemed I always had more riders than horses! 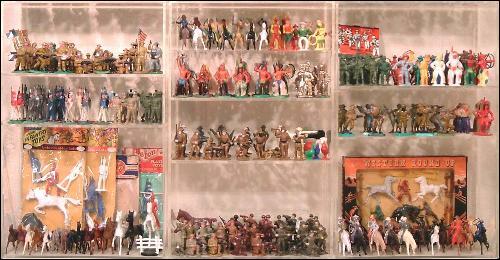 The first of the three shelves on the bottom right holds Ajax soldiers, cowboys, and indians that I began collecting because Ajax had pirated Beton’s figures. Reliable Plastics of Canada also copied some of Beton’s soldiers, and those are shown below the Ajax group. On the bottom right are the other companies that copied Beton’s small riders — Lido, Archer, and a few unknowns. The last photo shows an assortment of Beton boxed sets. I couldn’t get them all in, but I’ve included at least one of each type. For example, I have four different circus sets, but only one is shown here.